TEL levels are moderate, and appropriate quantities of effective lead scavengers and combustion chamber deposit cleansers have been incorporated into this fuel. Oxygenated octane improver’s are utilised; and a proven antioxidant is used to maximise storage life. Additionally, an extremely effective fuel system with cleanliness additives used. High heat values per unit volume and the capability of running leaner A/F ratios produce excellent mileage figures in real world race conditions. Recommended for high RPM engines with high CRs over 14:1 when additional octane is required for better detonation protection. This fuel is specifically designed for large capacity engines with rpm ranges in excess of 7000 rpm. Especially suitable for circle track racing with rapid throttle changes like Australian Speedway. VP 110, C12 & C14+ – Minor retuning required (Depending upon compression ratio). Sunoco Standard & Supreme – Minor retuning required (depending upon compression ratio). BP / Shell Avgas – No retuning required (When Upgrading to ERC 110K). With its natural cooling effect, it is extremely effective with mechanical supercharging in a non inter-cooled application. VP C16 – No retuning required. VP Import – Minor retuning required. 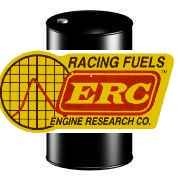 ERC A-19A is not recommended for supercharged or turbocharged engines, use in air-cooled engines (with some exceptions), or any other application where a gasoline with high convective cooling coefficient is required. VP C14+ & C25 – Minor retuning required. Sunoco HCR+ & Maximal – Minor retuning required. This fuel has consistently out performed equivalent competitor fuels and does not have issues (Like other high MTB based fuels) of requiring special injectors for use in EFI vehicles. VP ROO16 & Q16 – No retuning required. Sunoco EX02 – No retuning required. VP Roo25 / Dingo – Minor retuning required. VP PSX-AU – Retuning and carburation changes required.